While those versions of Captivate and Presenter have been out for a while, the updates to Framemaker and RoboHelp allow the entire TCS to finally hit a new release (release notes). A couple RH updates seem well overdue – a revamp of the UI to finally move to the newer Office UI style (yay for the Ribbon?!) and improved Search capabilities. However, more significant is a suite-wide support for responsive HTML5 publishing. And while perhaps targeted to the ‘technical writer’, this suite of products allows quite a range of flexibility in development on online learning and reference materials. Record a lecture with a webcam and Presenter, create a post-lecture review and interactive assessment with Captivate, and use FrameMaker and RoboHelp to create just-in-time reference materials – all available on platforms from the traditional desktop to you preferred mobile device. AND with RtL support, those materials can be provided almost any language, now including Arabic, Urdu, and Hebrew (RtL support in Captivate). 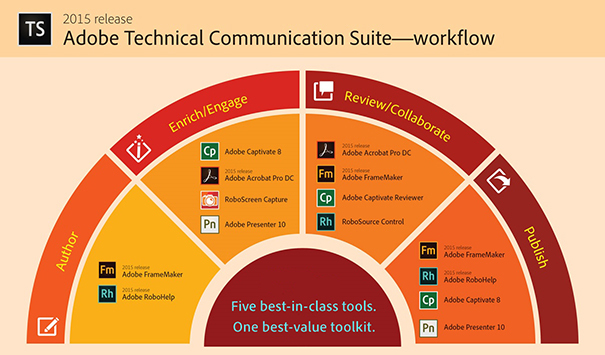 Unfortunately (or maybe, Fortunately, depending on your perspective), the only tool in TCS that is available in Adobe’s Creative Cloud is Acrobat. All the other products remain outside the cloud. 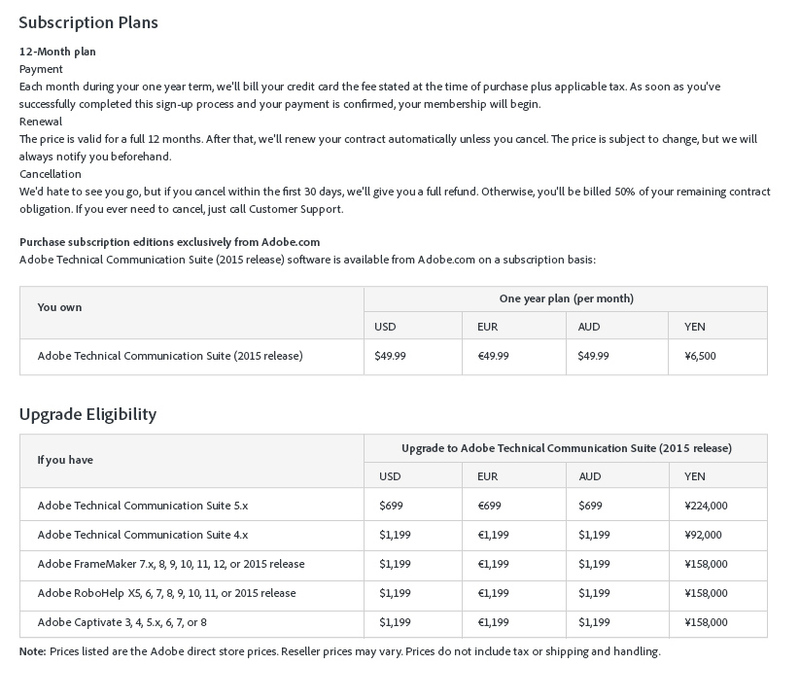 At least the TechComm Suite allows access to the group with a substantial savings (more than 50%) over individual licensing. Order a free 30-dial trial DVD, if you need that sorta thing.